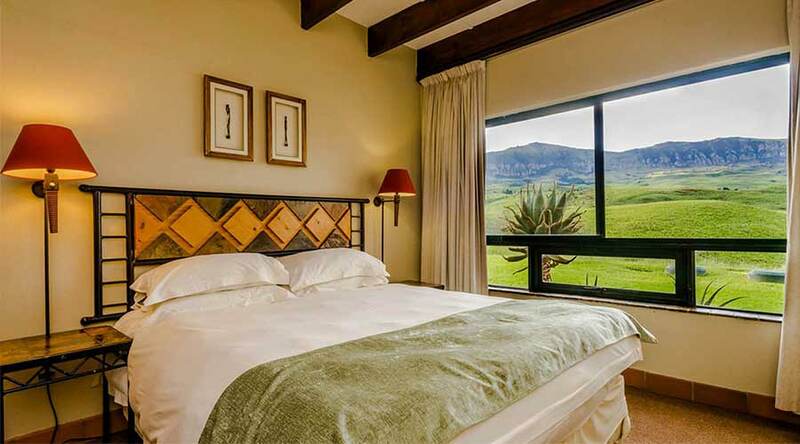 Relax in the comfort of the AHA Alpine Heath Resort nestled in the midst of the picturesque Northern Drakensberg Mountains and conveniently located mid-way between Durban and Johannesburg. This resort is a unique 'base camp' village for a host of holiday pursuits and it offers superb accommodation, fine cuisine and excellent conference and wedding facilities. Sports enthusiasts can indulge in a multitude of activities nearby and with a 'funtastic' variety of children's entertainment and a daily adult activity programme, there is something for everyone. 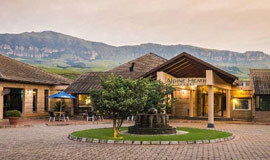 aha Alpine Heath Resort is truly a highlight of the Drakensberg and it's what makes this unique berg village so popular all year round. 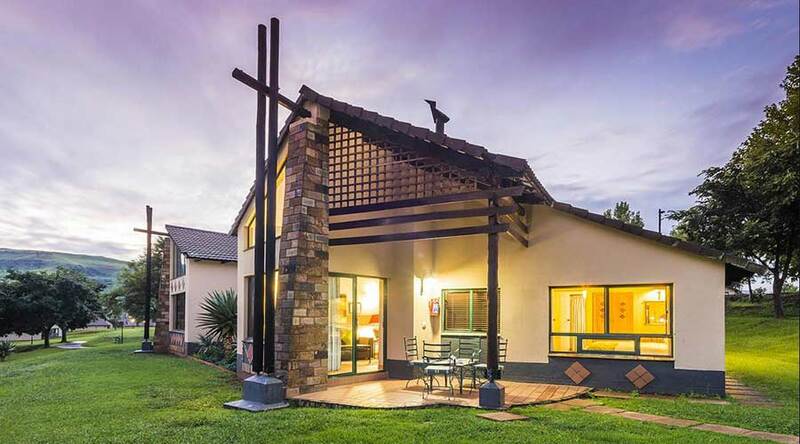 With 71 units, the recently refurbished 6-sleeper chalets each offers private braai facilities, a comfortable lounge, kitchen and dining area. Your chalet also includes a fireplace and patio, plus the convenience of a telephone, satellite TV and good cellular reception. Whether you’re looking for your morning brew, an afternoon pick-me-up, or a social buzz, grab a table at our laid-back coffee bar. Here at Coffee Co., you can enjoy anything from cappuccinos, espressos and lattes to an à la carte menu and buffet to perfectly compliment your beautiful surroundings. Depending on the total number of bookings, either an à la carte, light snack menu or buffet-style breakfast and dinner is served at this stunning restaurant. Enjoy an authentic meal at our Italian-style pizzeria with a wood-fired oven. Relax in and around the resort’s glorious pools with a refreshing cocktail in hand and a scrumptious tummy-filler to tuck into. Visit our exclusive Village Market and its charming Village Square for a unique shopping experience. Here, you can stock up on general items such as freshly baked bread and pastries, farm eggs, cheeses, a variety of cold or marinated meats, braai packs, milk, fruit and vegetables. Your children can also enjoy the Little VIP Club for the day, so they can participate in educational activities such as bug hunting, bush collage-making, biscuit decorating and treasure hunting. PLEASE NOTE: aha Alpine Heath does not offer a babysitting or daycare service. Miniature Golf: Enjoy this challenging, 18-hole course; Table Tennis;Tennis Courts; Squash Courts; Pool & Darts; Fishing; swimming pools; , trampoline area; volleyball courts. When it comes to Drakensberg adventure activities, exploring your surroundings on horseback is a must! Interact with our lovely Nooitgedacht horses on an outride at the equestrian centre. For romantic trail rides, enjoy a deliciously prepared picnic basket in the serene setting of the mountains. Otherwise, our fun Horse Play program caters to all levels of experience and includes washing, feeding and grooming the horses under supervision. Outrides Choose between a 1-hour or 2-hour guided outride. Pony Rides The little ones can enjoy scheduled daily rides during peak season, and over weekends and public holidays during off-peak season. Explore the exciting Drakensberg hiking trails Natal’s Northern part of the mountains offer. Majestically dominated by the peaks from Sungubala to Babangibona, Vultures Colony, Mount Lebanon and Baboon Rock, you will stumble upon precious streams that flow into Putterill and Wanhoop and, in turn, drain into the Tugela River. Alpine Trails take you on adventures through open grass veld and areas broken by pockets of Proteas along hillside slopes and crystal clear streams. The rivers are habitat to a variety of flowers and game, while our walking and Drakensberg hiking trails include the Oribi trail, Yellowwood trail, and a signature route that is in close proximity to local attractions. All the walks listed below can be managed in rubber sole shoes or tekkies ( trainers ). Alpine Cascades with blue footprints Discover why this family-friendly route of ± 2km long is our most popular trail. Alpine Ridge & Knoll with orange reedbuck prints Explore the most scenic viewpoints along this ± 1.3km route. River Meander with red baboon prints Enjoy great opportunities for bird viewing along this ± 1.3km route. ROYAL NATIONAL PARK HIKES Vemvaan Alley & Policeman’s Helmet Join a round-trip trail of 4.5 hours for unique, springtime sights when the route is showered with purple and blue flowers along the way. Amphitheatre & Chain Ladder Hike (World Heritage Site) View the wonder of the Thukela (Tugela) River as it cascades down the face of the Amphitheatre, forming the second highest waterfalls in the world. This route is a moderate to challenging, 22km hike. Tugela Gorge A long and gentle walk for the moderately experienced hiker, enjoy this 22km, round-trip trail as it leads you through an indigenous forest and offers immaculate views of the Thukela Falls. Surprise Ridge & Cannibal Cave A moderate to challenging walk for the avid hiker, this 20km route boasts exclusive views of natural fern tree areas, as these can’t be seen anywhere else in South Africa. The Cascades, Lookout Rock & Tiger Falls Enjoy the thrilling sights of baboons, bushbuck and mountain reedbuck, as well as quick blue flashes of Kingfishers in the Mahai River during this 3.5-hour route. PLEASE NOTE: As this Valley encompasses a number of properties, common courtesy dictates permission should be requested from the owners before entry. Kindly enquire at reception to arrange for access on your behalf. o add to an unforgettable getaway, you are guaranteed memorable climbs, exposed traverses, breathtaking views and thrilling downhills. IMPORTANT NOTICE All riders and runners will each receive a map and are required to sign an indemnity form. Your pass needs to be clearly visible at all times and won’t be valid after its expiry date. A single pass may not be used by more than one person. Trail passes will be required should you choose to run on trails outside the resort and wish to access the parking and toilets at any time. Please enquire at reception or purchase your pass from All Out Adventures – they are open from Tuesdays – Sundays from 09h00 – 16h30, and are closed on Christmas Day and Public Holidays. For a more relaxing Drakensberg activity, be treated with techniques designed to rejuvenate your body and mind after a long day of sightseeing! The resort is proud to bring you the pleasure of a stunning, on-site beauty salon and spa, so make the most of your mountain getaway by booking an unforgettable, holistic health experience. 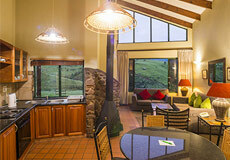 Alpine Heath Resort is located in the Northern Drakensberg, 3.5 hours from Gauteng and 3 hours from Durban. includes Friday and Saturday nights. Take the N3 South towards Durban, until Harrismith. From there take the N5 West towards Bethlehem for 4 km only. Travel for a further 8km only. Turn left following the R74 towards Bergville, and down the Oliviershoek pass. After 38km, the road levels out. Turn right towards the Northern ‘Berg Resorts. After 6 km turn right again towards The Cavern, Alpine Heath and Hlalanathi. Signpost will be seen along the road. Follow the signposts to the Alpine Heath. Travel north on the N3 towards Johannesburg. After passing Estcourt Shell Ultra City, take the Ladysmith, Bergville and Northern ‘Berg Resorts Offramp (R74). Turn left towards Winterton and Bergville. Travel through Winterton and 30km past Bergville. There, turn left towards Northern ‘Berg Resorts. After 6 km turn right towards The Cavern, Alpine Heath and Hlalanathi. 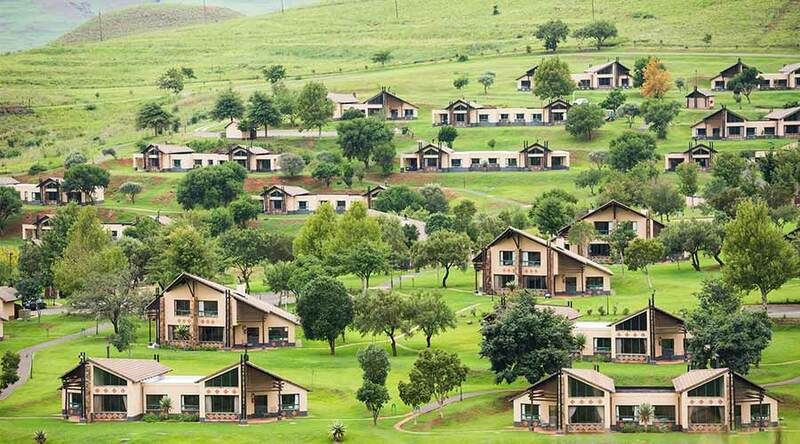 This northern Drakensberg resort, famous for it's "Alpine Village" style has 72 self catering chalets dotted around the mountain side. 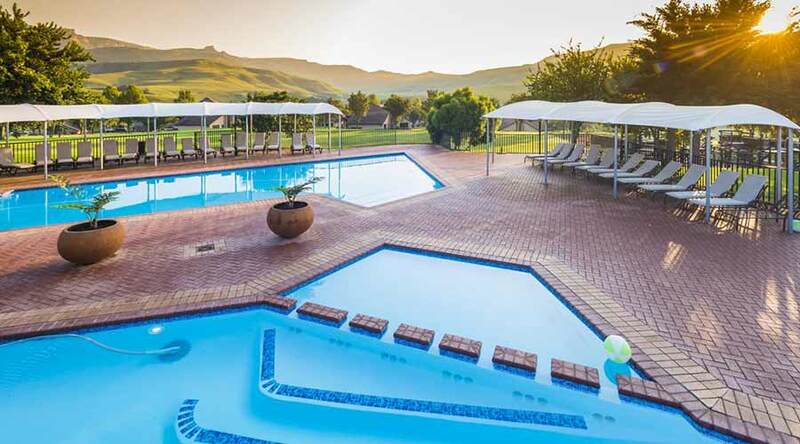 It is ideally suited for both family holidays where there is plenty to do for kids or for conferencing where the facilities are able to cater for large groups with ease.